In today’s interview, I am speaking with Gina DuQuenne the original pioneer and founder of SOPride. Gina is excited to announce that Southern Oregon Pride has passed the parade torch on to Lotus Rising Project. As founder of SOPride she is pleased to see her dream has learned to stand on her own and fly. 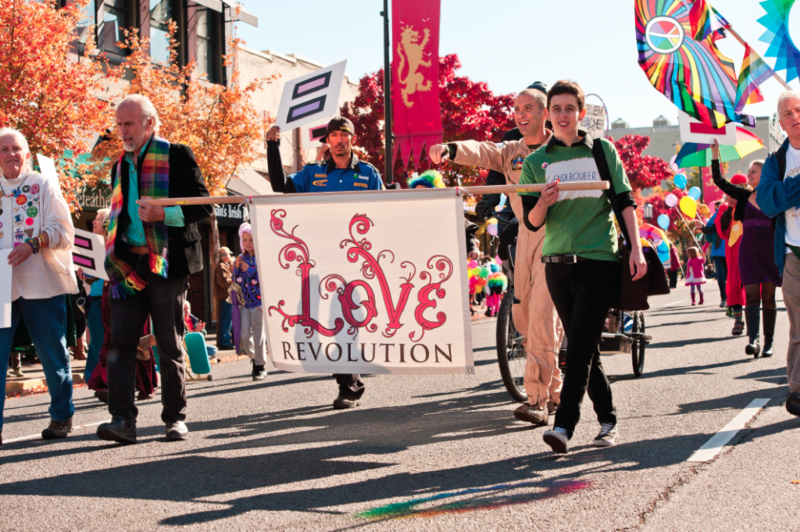 Lotus Rising Project has renamed the parade “Rogue Valley Pride Parade”. The festivities will begin a week ahead of time with events from Grants Pass, to Medford and the finally in Ashland. Mario Fregoso, the executive director of Lotus Rising Project, and the Pride Committee, are working diligently on planning a successful prideful week this year. Events start October 7th with the Rogue Valley Pride Kick Off Dance in Ashland. Go to www.Roguevalleypride.org for all of the details! Gina, thank you so much for your efforts in giving all people a voice and recognition in this wonderful celebration. Take us back to the original idea that inspired you to create The Southern Oregon Pride Parade. In 2008 there was a rally on the plaza in Ashland. We gathered there in hopes that Prop 8 would be overturned in California. I looked around at my wife and asked her, where are the queer people? And where is our parade? That was May of that year. My very supportive wife told me if you are going to do this, go for it! I took to Google and asked a few questions and on Saturday, October 10th, 2010 we celebrated our first SOPride Parade. Since then D.O.M.A. has been overturned and marriage equality is in place. There are drag shows, queer dances, and great opportunities for so much more in the valley. I am excited that I could be a beginning part of this. I love the idea of everyone being able to express their authentic selves. I aspire to live in a world where we are all accepted, not just tolerated. We have come a long way but we still have a long way to go. Our transgender community has been overlooked by society as a whole. I want all people to be accepted and respected. Please talk about the fundraising and the SOPride scholarship program. Absolutely, this is a very big part of the interview. Southern Oregon Pride has gone in another direction of education and raising funds for the SOPride scholarship. Educating people about queer justice and redefining the word “equality”. So many terms, words, and people’s minds are archaic. I look forward to establishing a safe place where people can ask the uncomfortable questions and realize that we are all the same. Each year after the parade, SOPride has given back to the community that has given so much to us. We have given to Maslow Project, Daedalus, Lotus Rising Project and for the past four years we have established our SOPride Scholarship. A student from Southern Oregon University is awarded the SOPride scholarship to go towards their education. It makes sense to give to the future and the students are the future. 100% of all donations go to the SOPride Scholarship. Finally, any last thoughts or comments you would like to share with our readers? Yes, to quote one of my favorite writers and activist … “It is not our differences that divide us. It is our inability to recognize, accept, and celebrate those differences”. Love is love, is love is love… Enough said.